It’s still a tough world out there. After 37 years on the Landmarks Preservation Commission’s designation calendar, we hoped we’d be saying “Auld Lang Syne to landmarks limbo” for the former IRT Powerhouse (McKim, Mead & White, 1904, Eleventh Avenue between West 58th and 59th Streets). But during a morning of votes on 13 potential new landmarks, the LPC decided to keep the Powerhouse on the calendar, instead of going ahead and designating it as a landmark, while they continue to discuss a “regulatory framework” with owner Con Ed. “I’ve learned more about power than ever before,” said LPC Chair Meenakshi Srinivasan, describing her behind-the-scenes negotiations with Con Ed. Two other landmarks-in-waiting (a Catholic Church complex in the Bronx and the Alvar Aalto-designed conference rooms at the United Nations) were removed from the calendar (meaning they are now vulnerable to alteration or demolition), in both cases facing owner and/or political opposition. Ten other sites across the city were made official landmarks, in whole or in part. Back in 1897, little Virginia O’Hanlon (a resident of West 95th Street) wrote to the New York Sun to ask if Santa Claus really exists. The kindly newsman who replied warned her not to be “affected by the skepticism of a skeptical age”. But to have faith in the landmarks process when it is constantly subverted by powers outside of the Landmarks Law – explicitly drafted to protect the public interest, with no provision for owner consent – one really does have to believe in Santa Claus. – for making the IRT Powerhouse a landmark at last. 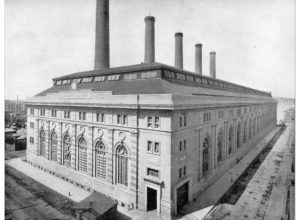 I urge the Landmarks Preservation Commission to designate the original IRT Powerhouse at 59th Street and Eleventh Avenue an official NYC Individual Landmark. This McKim, Mead & White-designed Beaux-Arts building is a magnificent example of industrial architecture from the City Beautiful movement. Its unique architectural significance and importance to New York’s transportation and industrial history merit landmark protection. Development immediately surrounding the Powerhouse site makes it especially urgent that the Commission act now to save this remarkable structure for future generations. Please do not allow opposition by owner Con Ed to thwart the public interest in designating and regulating this landmark. Give your neighborhood the gift of constant vigilance. Please donate to LW! today.